HONOLULU—An ‘ukulele owned by the late Israel Kamakawiwo‘ole will be featured in the new Grammy Museum that opens December 6, 2008, in Los Angeles. The Kamaka ‘ukulele made of koa wood will be featured within the section dedicated to “Roots” music forms, where it will sit alongside stories and artifacts from the folk, blues, Cajun, and other “traditional” musical forms. “It has been my good fortune to be born into Hawaiian music; it is with that history that I can say that no one has ever captured the hearts of people around the world with their music in the same way as Israel. Israel and his ‘ohana (family) as well as myself and Mountain Apple Company have received so much aloha from so many around the world, for which we will always be grateful.” Jon de Mello, CEO, Mountain Apple Company. “Israel loved his music—he lived to share that music with so many. So much has happened since he left this earth that he would be humbled by. Having one of his treasured ‘ukulele displayed in the Grammy Museum is one of the great achievements of his career. I imagine it is an honor any musician would be ecstatic to receive. As his wife, and on behalf of his daughter and grandchildren, we are so thankful,” said Marlene Kamakawiwo‘ole, wife of the late Israel. The Grammy Museum will occupy four floors at the heart of L.A. LIVE, an entertainment campus and a world-class sports and entertainment destination in Los Angeles. The Museum itself will use a dynamic combination of exhibits, public events, and educational programming to explore, celebrate, and experience: the enduring legacies of all forms of recorded music; the creative process of music-making; the art and technology of the recording process; and the history of the Grammy Awards, the premier recognition of recorded music accomplishment. The Grammy Museum will celebrate its grand opening with a slate of activities from December 3-7, 2008. For more information on the new Grammy Museum, go to www.grammymuseum.org. 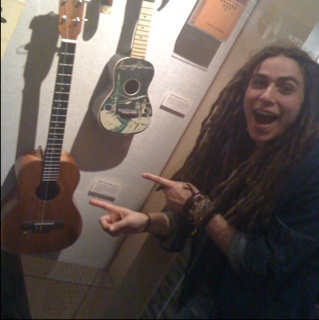 Here is the only photo I could find of IZ’s uke in the museum. If you have abetter photo please email it to me. Jason Castro at the Grammy Museum. This entry was posted on June 9, 2011 at 4:27 pm and is filed under Articles. You can follow any responses to this entry through the RSS 2.0 feed. You can leave a response, or trackback from your own site.